The Records Division handles the verification and release processes for all impounded vehicles. 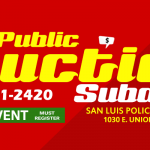 If your vehicle was impounded by an officer of the San Luis Police Department please carefully read the information the officer provided you at the time of the impound for important instructions. For any questions contact the Records Division at 928-341-2460. If your vehicle was impounded as evidence of a crime by the San Luis Police Department, you must contact the case officer for updates. If your vehicle was impounded by another law enforcement agency, you must contact that agency directly for assistance in obtaining the release of your vehicle. Releasing Impounded vehicles under the classification of "Authorized for Release"
If Owner is unable to come in for the release then the owner may use a Limited Power of Attorney to assign power of attorney to someone with a valid Driver’s License. You must fill out the Power of Attorney (link below) and have it signed and notarized, then you must give the original notarized form to the person you are assigning P.O.A to and they will bring it to the Police Department with all of the required documents (listed above). Click on the button below to download a blank Limited Power of Attorney form to release my vehicle. How to determine if you qualify for an early release and what to do if you believe you qualify. Instructions about how to get your vehicle after the 30 days has expired. What to do if the 30 days has expired and your driver’s license is still not valid. An option if the 30 days has expired and you live out of state and cannot return to get the vehicle released to you. IF YOU MEET ONE OF THE CRITERIA BELOW, AND CAN PROVIDE THE REQUIRED DOCUMENTS, YOU MAY POSSIBLY QUALIFY TO HAVE YOUR VEHICLE RELEASED EARLY AND CAN PROCEED TO THE POLICE STATION LISTED BELOW DURING RELEASE HOURS (9:00AM – 11:00AM OR 2:00PM TO 4:00PM – Monday through Friday). The following are common situations where we may be able to release the vehicle early. The required document list is provided after the impound situations. If you do not see your situation listed here, you may check the other examples listed at the bottom of this section. You are the owner, were not driving, and you sign an Agreement of Operation which basically states you will not allow a driver of your car to violate 28-3511 again within the next year anywhere in the State of Arizona. The Agreement will be explained fully at the time of the release. If the owner or spouse was not driving, and they can provide all required documents, and sign an Agreement of Operation which basically states they will not allow a driver of their car to violate 28- 3511 again within the next year anywhere in the State of Arizona. The Agreement will be explained fully at the time of the release. If the driver is the car owner, they must have a device installed in the vehicle while it is at the tow yard, and they must provide paperwork showing it was installed. If the owner was NOT the driver, and they do not have an interlock restriction, no installation is required. They can provide all the required documents and sign an Agreement of Operation which basically states they will not allow a driver of their car to violate 28- 3511 again within the next year anywhere in the State of Arizona. Early release will be granted if all required documents are provided ALONG WITH the rental contract and letterhead authorizing their assigned employee to recover the vehicle on the company’s behalf. That employee must also provide credentials showing he/she works for the rental car company. Early release will be granted if the Lien Holder is repossessing the vehicle and can provide ALL required documents. Refer to (Lienholder and repossession information) for release information and required documents. Current registration on the impounded vehicle. It must be current and not have a Mandatory Insurance “M/I” suspension on the plate. If the paper registration is in your car, you do not need to bring it and we will try to look it up in our computer. A money order or cashier’s check made out to the City of San Luis for $150.00. No other forms of payment will be accepted. The pink or yellow copy of the vehicle impound report, or the DR# (09-00000). If you are the spouse, and not listed on the registration, you must provide your marriage license. If you were required to have an ignition interlock device installed, you must have paperwork from the company showing it was installed on the vehicle which is currently impounded. Rental car companies must provide the rental contract and letterhead authorizing their assigned employee to recover the vehicle on the company’s behalf. That employee must also provide credentials showing he/she works for the rental car company. Lien Holders, refer to (Lienholder and repossession information) for required document information not listed above. IF YOU BELIEVE YOU MAY QUALIFY FOR AN EARLY RELEASE, YOU MAY TAKE ALL OF THE REQUIRED DOCUMENTS TO THE MAIN LOBBY OF THE SAN LUIS POLICE STATION AT 1030 E UNION STREET. See the “hours, Location, Payment Information” for current release hours and information. At that time, we will review the vehicle history and your documents. If early release is authorized, we will give you the release paperwork you will need for the tow company. Early release is based on Arizona State Law and the vehicle history. We are unable to take personal circumstances/hardships into account. If you believe an error was made, and you request a hearing within 10 days of the date of impound, and the Hearing Officer determines the impound was invalid. Refer to the “Request a Hearing” link for further information. A cash or money order made out to the City of San Luis for $75.00. No other forms of payment will be accepted. The pink copy of the vehicle impound report or the Case Number. Lien Holders, refer to associated link for release information and required documents. If the 30 days have expired and I own the car but my driver’s license is not valid, or I live out of state and cannot come in for the release? If you are the owner, you may use a Limited Power of Attorney to assign power of attorney to someone with a valid DL. THE POWER OF ATTORNEY CAN ONLY BE USED AFTER THE 30 DAYS HAS EXPIRED. You must fill out the Power of Attorney (link below) and have it signed and notarized, then you must give the original notarized form to the person you are assigning P.O.A to and they will bring it to the Police Department with all of the required documents (listed above). Click here for a blank Limited Power of Attorney to release my vehicle. The Power of Attorney may only be used AFTER the 30 days has expired. The towing company is prohibited from releasing this vehicle to you unless you have the SLPD release form. Please note: If your vehicle is unclaimed for more than ten (10) days after the 30 days has expired, under Arizona law the towing company may file a claim for an abandoned title and seek ownership of this vehicle on the 41st day of impound. If you will be delayed in getting your vehicle, please contact the towing company to make them aware you are not abandoning the vehicle.